Founded in year 1904 by Dr. William Mathias Scholl, for more than 100 years, Scholl is a renowned shoe brand recognised for protecting our sole and providing leg comfort at the same time. Such a well-known brand since my parents and grandparents generation, it's my pleasure to witness their year 2013 Autumn Winter Collection. Once again, thanks for the link up by Tammy, me, Jean and other bloggers managed to get the first hand news on the collection that lined up as the Autumn Winter collection of Scholl. The more I get to know about Scholl, the more I realized that how important our feet is to our body and how much more we can do to protect it from being harmed by the shoes we choose to wear each day. Compare to beauty, our health is more important and deeply in need to be taken care of anytime. Scholl outlet at Sunway Pyramid. Here are the first wave of Autum Winter collection that have been release in July. 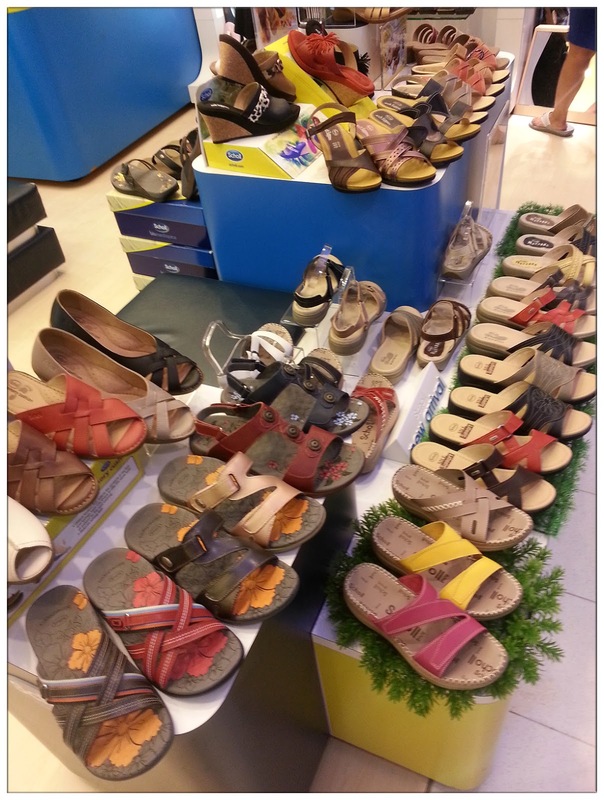 Each footwear has its own function and benefit to the wearer. You can choose the one that suits your needs. Similar design, which should I choose??? 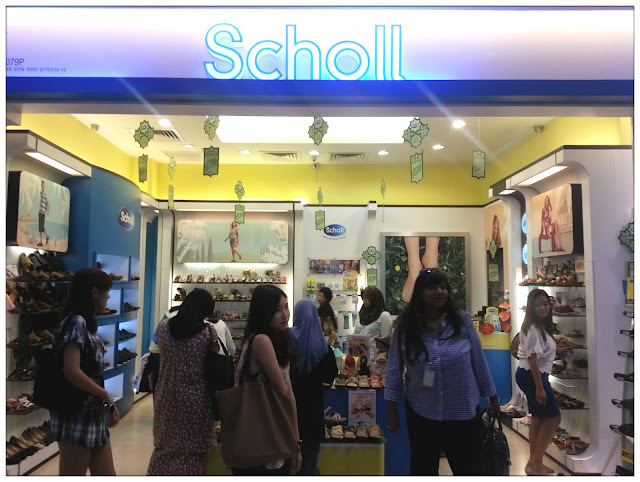 After a tour around Scholl's outlet, only I find that Scholl have so many good designs that comes with comfortable sole and also some with functionality which is good for the backbone too. There are some funky designs that suits for beach wear, some classic designs which suits for working attire and also some good looking footwear that suits for daily outing. After a hard time deciding, I finally made up my mind and opted for the white sandal. 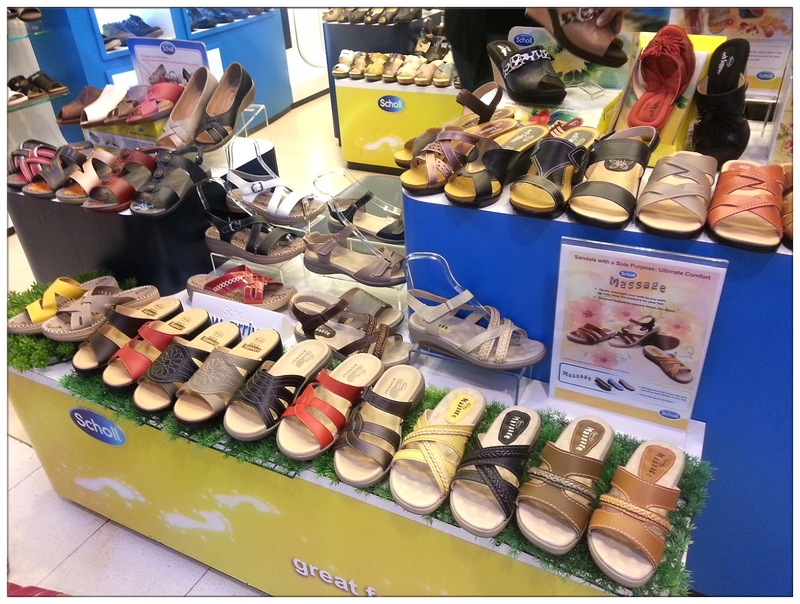 I really love the colour, design as well as the comfortable feeling of wearing the sandal. You hardly can see it here but this is the first time I'm wearing it after I get the sandal. 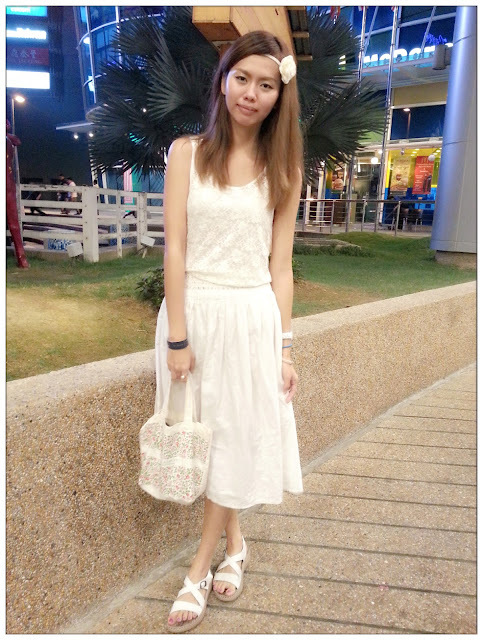 Outing for a whole day with friends never felt so comfortable and light-weighted! Love how the sandal matched with my daily coordinate. Besides the current collection that are sold at Scholl's outlet, you should check out what's coming to the shelf as there are many, many different types, colours and designs and surely there'll be one pair of Scholl that you like! Designed with special function Arch Support, this collection ensures those with flat feet, weak or fallen longitudinal arches get the support that they need as long as they are wearing this collection. Mainly in red, tobacco and black, the collection comes to you during the festive season of Deepavali right after Raya! With Edge Collection available from September, buying a pair of men shoes will be easier. It is sleek and stylish and perfect for those who wanna find a pair of comfortable shoes for dinner and party all night long. With the collection's Massage foot bed, I bet you won't be having any after-party sore feet and legs anymore! With Evelyn's Sole Support, these sandals comes with easy slip-on and sling-back design which make it your perfect grocery/business trip footwear in October. Sole Support foot bed lets your feet and toes exercise for better grip as you walk to tone up your toe muscles. These earth-toned foot wears also provide additional support to weakened metatarsal arches so that the ball of your foot is protected. The shoes are attached with a floral motif and are more feminine compared to the other ranges in the collection. Available in peach, dark brown and taupe, this collection comes with Arch Support foot bed, which makes walking around for Deepavali friends and relatives house visiting a breeze. As for the guys in November, the Edison Collection with Scholl's Gelactiv foot bed, a gel for impact absorbing makes walk, work, running errands and partying nothing but comfortable. With stylish and hip designs, these foot wear are made to cushion and protect from the impact of how you move around with it. Scholl's Edeline collection comes with Arch Support will be available in the market in December, which makes it a perfect timing for Christmas! Available in Black, Brown, Camel and Red combination, footwear from this collection is gonna make a stunning impression during Christmas. This gotta be one of my favourite designs! Love how the ribbon motif light up the shoes and make it look classy yet cute at the same time. This collection are perfect for your formal wear to party and dinner functions, stylishly comfortable in open toes or slip-on designs. The ribbon motif really does make one feels like a princess and dance her night away. I'm looking forward for Scholl's upcoming Autumn Winter 2013 collections to be release in their outlets. Scholl are available in all major shopping centres and shop lots nationwide, it will never be difficult to spot Scholl available at shopping places near you. Thank you Scholl for them comfortable shoes, love it!